Do you remember Goku Raku Ramen? There is only one Goku Raku Ramen in Penang, which is located inside Gurney Paragon. But now, it has been replaced with Edo Ramen, bringing ramen to everyone with more affordable prices. Edo Ramen is at the Ground Floor of Gurney Paragon, which is, right beside the left front door of the Gurney Paragon Mall main entrance. If I were you, I will definitely go for the Ultimate size with so much of extra dishes in the ramen. This Ultimate Black Ramen is the most special ramen in Edo Ramen, you gotta mix the fish powder and the garlic oil into the soup and it will taste so so so good! The soup is rather thick and rich in taste, not a bad choice if you are a ramen lover! The taste of the soup is rather light compared to the Ultimate Black, but for those who don't really like a thick flavoured soup, I would suggest you to go for Tokyo Soup as the taste is not too strong, suits kids and those who prefer their soup to be more light in taste. Their homemade ramen here is very authentic and springy, which was the feeling that I love the most about ramen. You can also order extra ramen if the portion is not enough for you. Extra Kaedama Noodles will be charged at RM 2.50 each portion. In every ramen, there will be one Nitamago, the Nitamago that I had was a bit overcooked, but overall it is still good to have this together with ramen. Every extra Nitamago will be charged at RM 2.50 each too. For the Ultimate Ramen, it will be consist of a piece of Braised Pork Belly. The Braised Pork Belly is slow cooked for few hours until it is soft, tasteful and yummy. It will melt when you put it into your mouth! There are 5 pieces of Char Siew in this side order, I like the teppanyaki taste where there are onions and other spring onions to make the Char Siew taste better. It is good to see that the menu here is simple but also comes with side dishes. This boiled version of Gyoza was rather soft, or maybe the one I had was a bit overcooked because the Gyoza was too soft that it just melted in my mouth, I don't even need to bite it. I wouldn't really like Gyoza to taste like this, but I think this would suit those elderly and children. The Fried Gyoza would be my preferences, this tasted so good and the Gyoza wasn't really dry, just nice and a little bit of crispy. Their sauce is the key to make this Gyoza taste even better. Lastly, a group picture in between the chefs and all the bloggers. It was nice meeting all of you guys again! 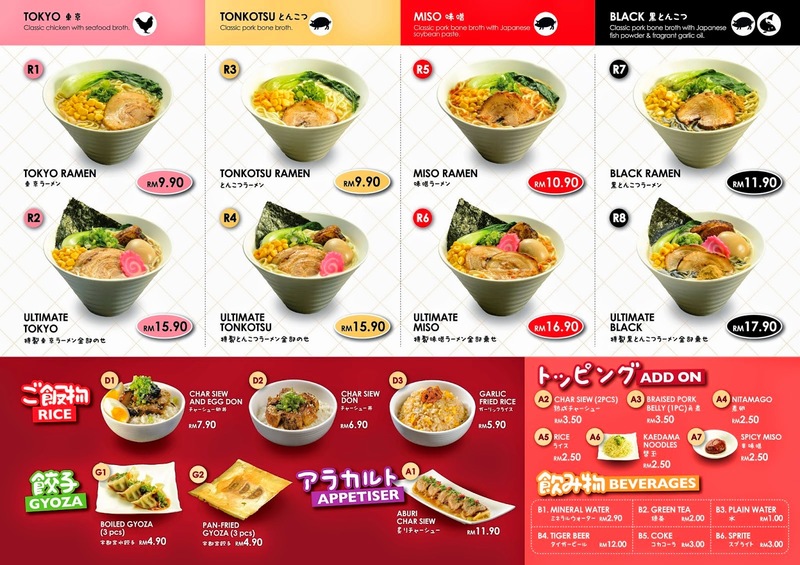 The menu of Edo Ramen is very simple, you may click on the below picture to enlarge it. 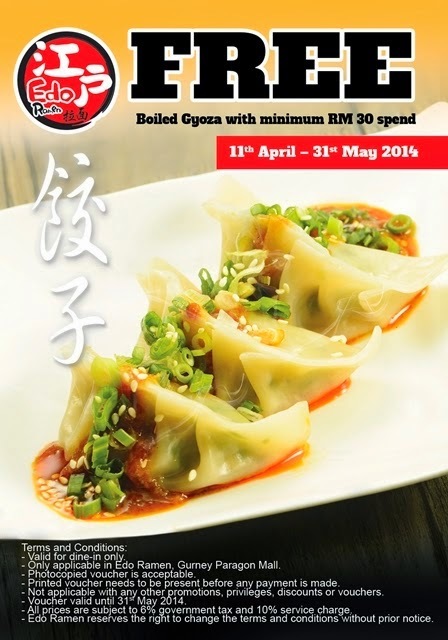 For their opening promotion, they are giving out Free Boiled Gyoza for every minimum spending of RM30 in a single bill. So don't miss out this promotion while it last, it is until 31st of May only! Address: Lot 163-D-1-05, Gurney Paragon Mall, Persiaran Gurney, 10250 Penang, Malaysia. As all of you know, there are pretty a lot of cafes around Georgetown, some are kinda famous, but some are remained hidden. I accidentally found this small cafe that located in Chulia Street when I was following my friends for a cup of coffee. Coffee Junkie was previously known as The Daily Dose, which was located at Carnavon Street. Now it has moved and merged with Junk, which is located at Chulia Street. Since The Daily Dose, they were famous for their coffee, which is one of the best in Penang. Why is it called Junk? For those who knows how to appreciate these stuffs, they can call them treasures! The range are very broad, from old radios, TVs to typing machines and etc. Don't forget about our main topic here, it is about Coffee. The menu is hung on the wall. An art piece made by the boss of Junk himself. I ordered a cup of Iced Caramel Macchiato, I would say that it is better compared to some well known coffee house. Furthermore the coffee is kinda thick and with nice aroma, as you can smell from the outside of the cafe. Some parts of this cafe is kinda creepy though, sorry that I'm not really that "artistic" person. Guess what? These are real eagle bones, and there is also a fresh one waiting to rot to bones slowly. Some junks are hanging around the ceiling, but don't worry, they are tight and steady. This is such a unique and nice cafe to chill. Not to mention that their coffee are quite nice, even foreigners love it too. Coffee Junkie @ Junk, Chulia Street, Penang. Miraku Restaurant is a Japanese restaurant that located inside G Hotel. I've heard about this restaurant since long ago but have yet to give a try. Last week, I finally get to pay a visit together with other bloggers for a food review. The chef from Miraku Restaurant import most of the ingredients directly from Japan, but still keeping its' freshness. It is a Japanese fine dining restaurant that provides variety of choices from the best of Japanese Culinary to Malaysian. The chef told us that their Sashimi will be air flown every Tuesday and Friday. So I guess on Tuesday and Friday would be the best days to pay a visit. With no minimum order, no minimum pax. This is one of their signature salad. It has got Tako(Squid), Salmon slices, Scallop and Crab Meat in this bowl of salad. But I find that the vegetables are too much. Maybe 6 person can share this big bowl of salad. Small and medium size is also available. There are 4 types of dressing for you to choose. We've chosen Wafu and Tomato. This one is really filling as the Unagi is rather big piece, and what I like about this sushi is the Unagi is boneless. I always hate when I found out some bones in my unagi. Kinda like this sushi though. The chef told us that the Unagi is imported from Japan, well you can also tell from the size of the Unagi. I guess this can be consider King Prawn! The size of the prawn is so huge, every piece of this sushi is rather filling not because of the rice, but also the prawn meat that stuffed inside. On the top was a thin slice of Avocado, this dish is healthy and nice! All the fresh sashimi are imported from Japan, total 15 types of fresh sashimi that slice by the chef daily and serve fresh. I find it rather reasonable to have such a fresh sashimi at this price. One thing to focus about this dish is the handmade Wasabi by the chef himself. The wasabi here tasted stronger than the ready made wasabi though. As you can see from the layer, this sushi is rather filling and the fish was sliced nicely with no bones. I would prefer to have this sushi with their handmade Wasabi than the ready made ones. Their handmade Wasabi will be charged at RM 30.00 per plate though. The tofu steak was not bad. But it would taste better if they were to make their own tofu as the tofu tasted stronger than the sauce that made by the chef, though the sauce was rather tasty, but it would taste even better if the chef were to cook their own tofu. Similar like Matsu's version, this would be offered at fewer option of Sashimi, but they are still the same sashimi that imported from Japan while keeping its' freshness. I think this set would be good for 2-3person though. Chef's homemade matcha ice cream was very smooth and nice. It doesn't taste like the Nestle Green Tea Ice Cream which was so sweet and creamy. I would prefer this ice cream as it is also topped with red beans, which blended perfectly with Matcha Ice Cream. This is also their home made ice cream with their hand made wasabi, this is very refreshing and it will wake you up after having all your food. This is really nice and worth trying! Apart from the ala carte menu, Miraku also have special promotions for their customers. 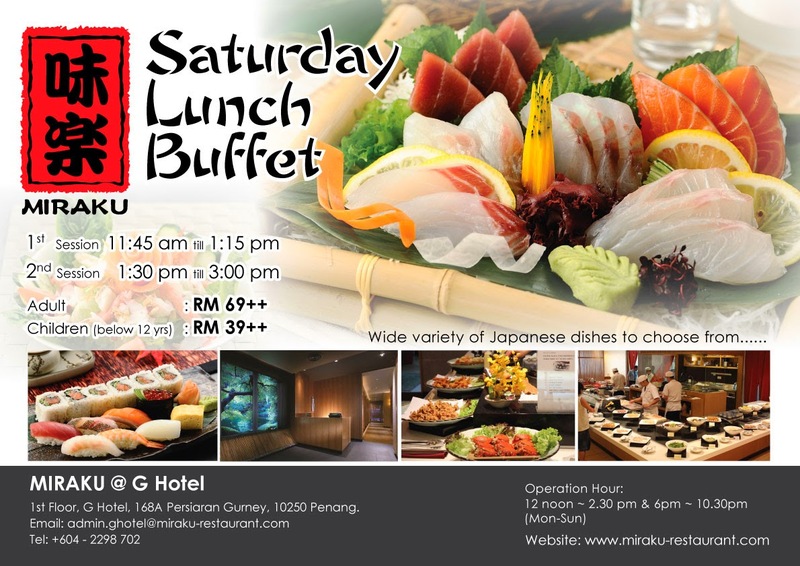 Miraku is now offering Buffet Lunch on Saturday with only RM 69.00++ per adult and RM 39.00++ per child. They offers wide variety of Japanese dishes and also sashimi for you to choose. Address: 1st Floor, G Hotel, 168A Persiaran Gurney, 10250 Penang.